Joy Creek Photo Archive (c) all rights reserved Rosa 'Vogelpark Walsrode' was named as a tribute to the largest bird sanctuary in the world. 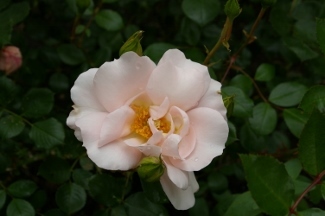 It is a worthy tribute with its repeat flowering, its disease resistance, and its sweet fragrance. The double flowers are soft pink fading to white, colors which contrast nicely with the golden central stamens. In bloom, the flowers are held on long stems in loose clusters. They are showcased by the dark lustre of the foliage. Summer. 4-5 ft. x 6.5 ft.